Eagle Ridge GM | Maintenance Tips | How Does Car Air Conditioning Work? Summer is a prime time of the year, rejoiced for its sunshine, its liberating energy, and its heat. Canada occupies a special place on the planet – internationally renowned for its epic winters and cold temps, yet we’re privy to some fantastic summer temperatures. But, with those hot and humid temps comes inevitably complaining about the heat. After all, there’s nothing better then the refreshing cold from a brand new vehicle on a hot day. Driving in a stuffy steel box with no air circulation can be an awful experience. There’s little in life that compares to the respite we feel when entering an air conditioned space. Originally patented by Packard in 1939, air conditioning has added chill to the air in our vehicles. By 1969, about half of all cars sold had A/C and 2010 about 99% of all vehicles sold have featured the luxury. Car air conditioning works to fulfill two specific tasks, through a low-pressure and high-pressure stage. First, its purpose is to cool the air that enters the passenger cabin, and then to remove the moisture from the air to improve passenger comfort. Many auto brands actually integrate air conditioning in the defrost setting as well – a process that helps to remove the humidity that contributes to foggy windows. But how does it work? 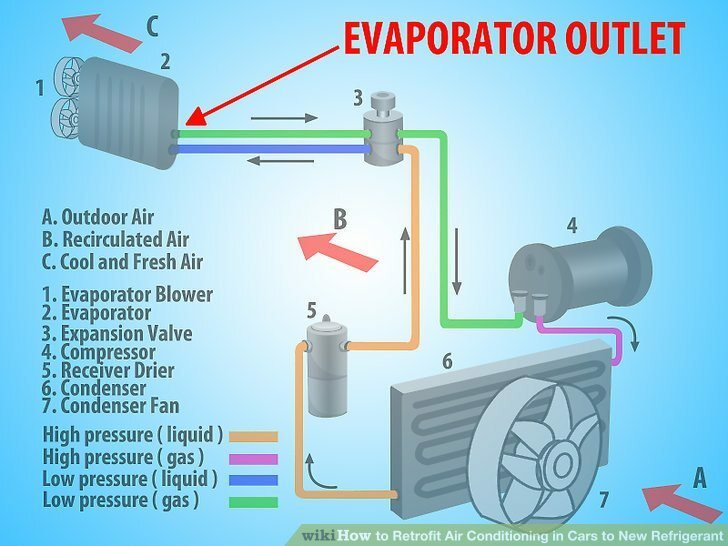 Car air conditioning systems are constantly under pressure from a gas known as a refrigerant. In the past, a gas known as R-12, CFC-12, or its brand name Freon was used for decades until it was discovered that the gas was having a profound effect on the ozone layer. A chlorofluorocarbon, Freon is an organic compound that contains only carbon, chlorine and fluorine, and was produced as an erratic imitative substitute for methane, ethane, and propane. It was banned from production in the US and replacements called R-134a or HFC-134a were required in all vehicles produced after 1996. The Compressor is in essence a pump that is powered by a belt connection to the engine’s crankshaft. When the shaft allows the refrigerant into the compressor, the belt drives the pump, putting the refrigerant under pressure. The system’s condenser acts just like a radiator wherein pressurized gas is cooled by the expansion tubes that chill and turn the gas into a liquid. Next, the cooled refrigerant needs to be prepared for the evaporator and is sent through a tiny tank called the receiver or dryer. This reservoir contains desiccants, a hygroscopic substance that helps liquids to sustain a state of dryness. These desiccants keep water away from the air – very similarly to the packets of silica salt found in shoe boxes. After flowing through the dryer, the cooled liquid is put through expansion tubes where – you guessed it – it’s permitted to expand. This is the first stage of the low-pressure process where the refrigerant is allowed to relax before it is sent through the evaporator. This expansion valve is one of the more commonly serviced pieces of a vehicle’s A/C unit. The valves are moving parts that can easily wear out over time. The evaporator is where the hard work of both the high-pressure stage and low-pressure stages comes to life. The evaporator is usually located underneath the dashboard within the cabin of the car. It functions to convert the cooled liquid back into a gas through a series of coils. The liquid boils the refrigerant to the point where it becomes gas and is then pushed out of the evaporator as a cold gas. 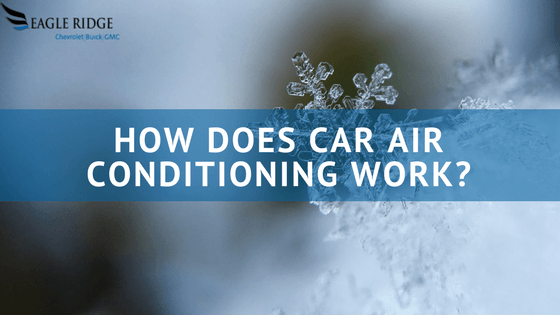 How Often Should Car Air Conditioning Be Serviced? A/C systems add value to your vehicle, so keeping them in good working order. It is just as important as maintaining your vehicle’s paint, or exhaust system. It’s common for refrigerant to leak, and leaking refrigerant can be damaging to your compressor and evaporator. Not mention, the environment as well. A common sign of this potential issue is when your A/C isn’t as cold as normal. It’s also common for a fan to malfunction, preventing cold air from entering the cabin of your vehicle. Over time, the gaskets and o-rings within the A/C unit can become loose and worn out. It’s more common to see air conditioning units go through preventative maintenance than full-on repairs or replacements. The best way to tell if your A/C unit is in need of a maintenance service is to use it. When the air stops being cold, ask a warranty-certified service provider to look over the complete system.